HomeCinemaHollywood GossipWatch Out Prince Philip, Tom Cruise Is Up To Something! 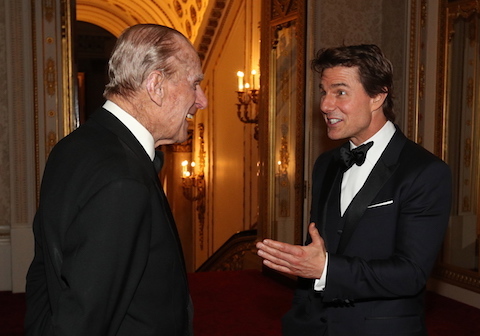 Watch Out Prince Philip, Tom Cruise Is Up To Something! Tom Cruise charmed the upper-crust crowd when he turned up unannounced at an Outward Bound charity event at Buckingham Palace. (The charitable organization encourages young people to have confidence in everyday life.) As you may know, Tom has a home in the UK he’s selling and plans to move into L Ron Hubbard’s CASTLE, which is being renovated for him there. Tom, 54, turned on the charm and engaged the Prince, 95, in what was described as an animated conversation. Tom has big plans for Scientology in the UK- his daughter Isabella is also expected to play a large part in the expanding church there. Keep in mind that weaseling its way into charities is one method Scientology uses to build up good will in a community. All we can say is WATCH OUT!